Finally, Free Online Guitar Lessons That Explain GuitarChordTheory. When most people hear the words "GuitarChordTheory" their eyes glaze over like they did in high school algebra class. There is confusing talk of sharp this, flat that and diminished the other. We're going to take some of the mystery out of this topic so that you can play more creative, interesting music. You'll find that this is one of the most informative guitar lessons online. It's a good idea to know the names of the notes on the fingerboard. Guitar chords are built by combining notes from scales. In popular music this usually means major and minor scales. Nearly everybody knows a major scale. Do, re, mi, fa, so, la, ti, do. Sounds familiar doesn't it? Let's put two scales togather to make a two octave scale and give each of these names a number. Our GuitarChordTheory lesson will start with the most basic type of Guitar Chord-the triad. A triad is a three note chord. The starting point will be a major triad. The major triad uses the 1-3-and 5 notes from the major scale. So if we are in the key of C that will be the notes C, E and G.
If you lower the E one fret making it a flatted 3rd you've got a minor triad. Taking the minor triad and lowering the G one fret making it a flatted 5th, creates a diminished triad. There's one more triad to explore, the augmented. The augmented triad is a major triad with a raised 5 note(G# in the key of C). It's amazing the difference in sound that moving just one finger can make, isn't it? The great thing about learning these triad shapes is that they are moveable. If you know how to play a C major triad you know how to play a D major triad. Just move your C major triad up to a D. TA DA! A D major triad.This works with other Guitar Chord shapes too. Triads that have the notes on strings right next to each other are called closed triads. Triads that have an open string between the notes are called open triads. Open triads are good for the fingerstyle guitarist because they sound more full than closed triads. A good way to put this GuitarChordTheory to work is by playing harmonized scales. A harmonized scale is a scale that uses chords instead of single notes. The formula for playing a C major harmonized scale is - C maj, D minor, E minor, F major, G major, A minor, B diminished, and C major. The pattern of major and minor always stays the same, whatever key that you're in. We can re-arrange the order of the notes in a triad or guitar chord. This is called inverting the chord and the new shapes are called inversions. The shape that we've already looked at is called the root inversion. Let's take a look at our C major triad(C-E-G). If we make the E our lowest pitched note, the G the next lowest pitched note and the C our highest pitched note we have created a 1st inversion C major triad. When you do the same thing but stack up the notes G-C-E you've got a 2nd inversion triad. It's pretty logical when you think about it. Knowing different inversions of Guitar Chords gives you more tools to put in your guitar playing toolbox. Suppose you have a song that you're learning out of a songbook. All the songbook is giving you is the melody line in standard notation, the songs lyrics and chord names. O.K. Now you get to a part of the song where the melody note is an E but the chord that they call for is a C. What do you do? Why you whip out your 2nd inversion C major triad. Problem solved! Any Guitar Chord, no matter how difficult it looks, can be inverted. While we're talking about inversions...If you're singing a song and need help staying on the melody, choose a Guitar Chord inversion that has your melody note as the highest pitched note in the chord. This will help keep you singing in tune. The triads are going to tell you if a chord is "fish or fowl or vegetable". They define the nature of the chord. All the other notes that you add to them are "spices". The next stop on our GuitarChordTheory lesson is 7th chords. When we made our major triad from the major scale all we were doing was stacking thirds on top of each other. If we count the C as our 1 note, then the E is a third above C. This will make the G be a third above the E.
To make a 7th chord stack another 3rd (B) on top of your major triad. This will give you a major 7th chord. If you lower both the 3rd and 7th of a major 7th chord you'll get a minor 7th chord. Think of it like this. Take the minor triad that you already know and put a lowered 7th on. That's the way this GuitarChordTheory stuff works. You'll learn a little bit, like how triads work, and then you put something else on top of it. To make a dominant 7th chord, lower the 7th note in a major 7th chord one fret. An augmented 7th chord is made by adding a flatted 7th to an augmented triad. A diminished 7th chord is a little trickier. Put a double-flatted 7th on top of a diminished triad. The double-flat means that you lower the 7th note by two frets. Guitar Chords like 9ths, 11ths and 13ths are usually thought of as extended chords. Extended chords are used to dress up basic Guitar Chords like triads and 7ths. In fact, you can substitute an extended chord for a more garden variety chord. For example, you can replace a major chord with a major 6th, major 9th, major 13th or any other major chord. You can do the same thing with minor and dominant 7th chords too. As long as you exchange major for major,minor for minor and dominant for dominant you can choose whichever chord that you want to use. Interesting GuitarChordTheory isn't it? Sometimes there are just too many notes to be able to reach. On larger Guitar Chords you don't always have to play the root or 5th of the chord. The rest of the notes in the chord indicate what the root is. The 5th stands out the most when it's flatted or sharped. If you leave it out when it's just a regular 5th in the chord, it's not too noticeable. Here's a way to multiply the Guitar Chord shapes that you learn. It's a GuitarChordTheory technique called chord transference. Try this-play a C major triad starting on the 15th fret of the 5th string. Even if your guitar doesn't have a cutaway grab the triad the best you can. O.K. Move that shape over to the 4th string and slide it down to the 10th fret. Now slide the note on the second sting up one fret. It's the same C major triad. Just the shape is different. Here's the GuitarChordTheory that applies here: move a Guitar Chord shape to the next higher set of strings. If any note lands on the 2nd string move that note up one fret. Now move the chord down the neck 5 frets to hear the same pitches as the original chord. Move the chord shape up 7 frets to play it an octave higher. There's also a way to do a chord transference if your original chord starts on a higher set of strings. Let's take our lowly C major triad. This time we'll play it on the 1st,2nd and 3rd strings. Fret the 3rd and 2nd strings on the 5th fret. Now fret the 1st string at the 3rd fret. This is a root inversion C major triad(C,E,and G). Move this triad shape to the 2nd,3rd and 4th strings and slide them up 5 frets. Move the note on the 3rd string down one fret. Presto! Our old friend C major triad. Here's the rule of thumb that applies here: move a chord shape to the next lower set of strings. If any note lands on the 3rd string slide it down one fret. Now move the chord shape up the neck 5 frets to hear the same pitches as the original. Move the chord shape down the neck seven frets to play the chord an octave lower. Let's do some simple math. Say that you learn a root inversion triad using the first 3 strings of the guitar. Then you learn the 1st and 2nd inversions on the same set of strings. Using the chord transference technique gives you 4 different places on the neck below the 14th fret to play each triad.That gives you a total of 12 possibilities. Wow! You're getting pretty good at this. The GuitarChord Theory for Altered chords is that these are Guitar Chords that have one or more of their notes raised or lowered. 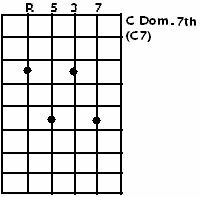 Here's the GuitarChordTheory: a C dominant 7th chord has a b7 as the fourth note of the chord.So it's just a regular ol' dominant 7th. If we lower the 5 note in the chord(G) a half step this "alters" our C dominant 7 turning into a C dominant 7 b5. Only 5ths and 9ths can be really be altered.If you try to alter any other note it turns into an altered 5 or 9 or it becomes a duplication of some other note in the chord. Don't let all of the numbers and sharps and flats that are used in GuitarChordTheory get to you. The secret is to break it all down into small enough pieces to work with. Start off by learning your triads. After triads, learn the 7th chords. After the 7th chords learn some extended chords then some altered chords. You can learn this! What is the best way to apply this GuitarChordTheory? One good way is to start with a major 7th chord and re-arrange the notes in it. 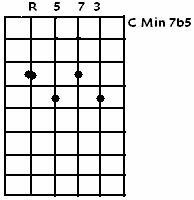 For example, lower the 7th one fret and you have a dominant 7th. One more fret and it's a major 6th. Lower the 3rd in the major 6th chord and you have a minor 6th. Raise the root of your dominant 7th chord 2 frets and you have a 9th chord. Taking your GuitarChordTheory and experimenting like this, combined with your chord transference technique, helps you have a ton of chords under your fingers in no time. Remember that guitar chords aren't just shapes on a page. Learning GuitarChordTheory will let you figure out how to play any guitar chord that you come across. Want to learn more GuitarChordTheory? Introduction to Chord Theory & Chord Voicing is a great resource!